You can’t help but learn something when visiting Wanda Lunn’s garden. The Cedar Rapids woman has one of only two display gardens in Iowa for the Historic Iris Preservation Society, and she readily shares her 50-some years of gardening knowledge. Wanda’s garden is a combination of historic and modern varieties of iris, intermingled with hundreds of daylilies and other perennials. 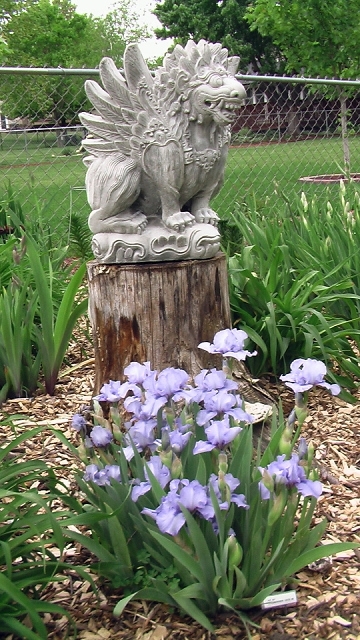 The oldest iris are generally less showy, with smaller blossoms than more modern versions. Wanda has hundreds of visitors to her gardens every summer and is willing to share the secrets of her success. One misconception she wants to change is the notion that iris are difficult to grow in Iowa. Wanda shows that is anything but the truth. Given adequate space (enough “breathing” room) and proper sunlight, the plants thrive. She doesn’t fear the iris borer, either. The borer doesn’t affect smaller intermediate and dwarf iris, she notes. Eggs hatch when temperatures reach 70 degrees, so as long as foliage is cleaned out before then – either in late fall or early spring – the borers shouldn’t be a problem on larger iris either, she said. Late freezes made last year a poor one for many plants, but Wanda said the iris, especially, are making up for it this year. Iris bloom only once on the “mother” plant, she explains. They then either reproduce or die. Those that didn’t bloom last year will bloom this year, along with their offspring. Anyone with spare time this weekend, or next, has the opportunity to see the resulting splendor in Wanda’s garden in northwest Cedar Rapids. Wanda notes that she has over 80 DIFFERENT clumps of dwarf , intermediate and miniature tall bearded iris blooming right now. Her garden will be open for those who want to see these rare, earlier iris bloom on Memorial Day, Mon. May 26 , from 10 a.m. to 4 p.m. In addition, she has hundreds of stalks right now on the tall bearded iris clumps that will be blooming next weekend, including more than 200 different cultivars in several categories: Historics, modern ruffled, amoneas, broken colors, plicatas and multi-colored. She also has several colors of peonies, several colors of Siberian iris and a multitude of other late blooming spring bulbs and perennials on the one-third acre lot. To see those plants in bloom, her garden will also be open to the public from 10 a.m. to 4 p.m. Sat. May 31 and Sun. June 1. Wanda and her husband live at 526 Bezdek Dr. NW, just off E Avenue. Look for more on Wanda’s iris garden in the Community section of The Gazette.